In the same month, five graduates of the University’s Civil Engineering program dominated the Board Examination. Garret Patrick S. Baluyot, out of the 2,738 board exam passers, earned the second highest spot with a rating of 93.25%. John Victor J. Lau, with a rating of 93.05%, ranked third followed by Oonre’ Zak Khalil O. Advincula-Go in fourth, with a rating of 93%. Royell B. Petterson, with a rating of 92.55%, ranked fifth, and Nicko Angelo E. Garachico, with a rating of 91.50%, ranked eighth in the civil engineer licensure exam. Mapúa garnered a passing percentage of 84.62% for its first-time takers. Out of 7, 599 exam takers in the country, only 36.03% passed the board examination. Mapúans were also included in the Top 10 passers of the April 2018 Electronics Engineer (ECE) and Electronics Technician (ECT) Board Examination. Mapúa University, with a passing percentage of 100%, ranked number one in the overall schools performance for the ECT licensure examination. Two graduates of Mapúa University made it in the Top 10 in the Architecture Board Exam. Arch. John Mikhail L. Ubungen, with a rating of 83.50%, ranked fifth out of the 1,126 architect licensure exam passers. Arch. Mark Angelo G. Vibandor landed 10th place with a rating of 82.70%. Mapúa earned a passing percentage of 86.05% for its first-time takers and an overall passing average of 81.48%. The University, reaching the 80% passing percentage requirement, made it on the list of top performing schools in the January 2018 examination. 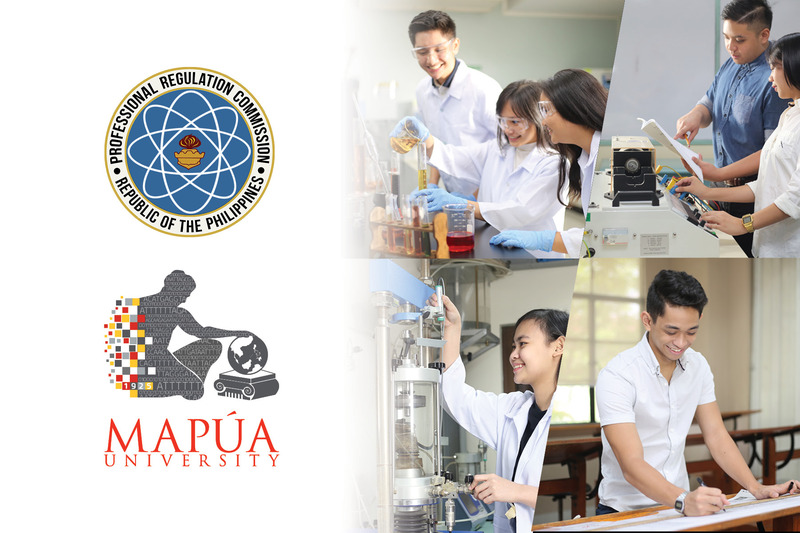 Mapúa’s Chemical Engineering, Civil Engineering, and Electronics Engineering are among the 14 ABET-accredited engineering programs of the University. These programs are also accredited by the Philippine Technological Council – Accreditation and Certification Board for Engineering and Technology (PTC-ACBET), a provisional member of the Washington Accord. In 2017 the Commission on Higher Education (CHED) tagged the three engineering programs of Mapúa, among others, as Centers of Excellence in the Philippines. These local and international recognitions given to the University came after Mapúa adopted the outcomes-based education (OBE) in its programs’ curricula. Also strengthening its international standing as a premier University, Mapúa was granted an overall 3-star rating for excellence in 2017 by Quacquarelli Symonds (QS), a world-renowned university ranking organization. Mapúa University now has a total of 350 board topnotchers across 11 Professional Regulation Commission (PRC) administered board examinations since year 2000.